March | 2018 | Why Be Tonto? Can We Treat Customers Better? 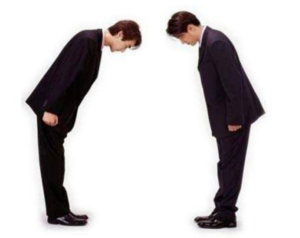 As you no doubt know, bowing, Ojigi (お辞儀), plays a strong role in Japanese culture. A plane pushes back from the gate, backing into the taxi area. It stops so the tug can be unhitched from the nose wheel. Nine ground crew line up shoulder to shoulder facing passengers gazing from the windows. As one, they bow deeply to the passengers. It’s only then the plane trundles away to the runway. In another little scene a man enters a jewelry shop. He takes a few minutes to view gold necklaces in an illuminated glass case. He doesn’t buy, but on his way out he is respectfully escorted to the street by a sales assistant. On the sidewalk the sales assistant bows deeply and thanks the browser for taking the time to look. You’ve probably guessed this is Japan. It’s a little different from say, Zales Diamond Store in Manhattan or Best Buy in West Hollywood. In our part of the world we say the customer is always right. But the Japanese say, Okyaku-sama wa kami-sama desu. It translates as the customer is God. More to that, instead of the word ‘customer’ the Japanese opt for ‘guest’ as it connotes deeper respect. We’ll never be culturally akin to the Japanese in Manhattan or West Hollywood but maybe we can do better in looking after our ‘guests’ and in managing CRM. At a time when too many marketers believe algorithms are the silver bullet, (how can that be correct? ), an effective way ahead might be to concentrate harder on customers. Maybe we should start creating more memorable customer experiences. After all, isn’t that how to bring your ‘guests’ back and back? Without repeat business it could be you who’ll have to bow. Bow to the superiority of competitors who streak past you. PS. Let’s hear from you. How are you treating customers like guests? If you’re at Ritz Carlton, no need to answer. Everyone knows you have a lock on going above and beyond.